AD Pete Mitchell dropped into real space in this TIE Guardian in an empty section of space far from any system. He immediately punched a few buttons on his nav computer to calculate the next jump. A minute later, he jumped again. A few more intermediate jumps, then he finally exited hyperspace with a view of the ISDII Challenge. He maneuvered into the hangar and landed. First, please congratulate MAJ Rando on his promotion today! It was most well deserved! The first month of TIE Corps in Battle has completed, and there is some good opportunity for some rewards, the scores weren’t too high this month, and the participation game is wide open! 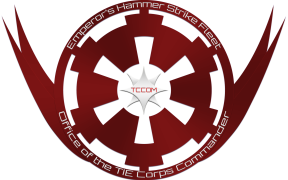 Only two participants with TIE Corps Spammers, so I’m going another round, but step it up! The best method for TIE to get the screenshot at this point is a cell phone pic of the mission log after the mission is complete. Finally, it’s MSE time again, so get those evals in right away! BSF’s and are due by Midnight GMT February 28th. BSF’s and screenshot submissions are due by Midnight GMT February 16th. In this competition, the rules are made up and the points don’t matter! Seriously! The objective of this competition is to complete the assigned free missions as fast as possible! Cheating is encouraged (In game cheats only)! To participate, simply fly the assigned mission and take a screenshot of the debrief screen that shows how long it took you to complete the mission. Submit the BSF to the database, and forward the confirmation email to the TCCOM along with your screenshot of the time it took. The shortest time for each mission wins for that platform and round. Each round will be two weeks. 1st place gets 4 points, 2nd gets 3, 3rd gets 2 and, each other submission gets 1. Participation points will also be tallied by ship and squadron. One point per mission flown. Flying participants of top participating ships and squadrons will earn extra rewards. IS-SW/BW for 1st and 2nd total points for the round (at least 3 participants). Game of Thrones and Star Conflict is a winning combo!